You went to the Observatory and didn’t get the fry bread?!!! You must return immediately! It really is as amazing as everyone says!! Ugh, I know, but we both got veggie burgers! We live out Parkrose way, so we’re in Montavilla quite a bit. We’ll be back! I’ve never been, but have heard so many awesome things! Putting this on my summer list. Makes a very nice cap to a visit to Mt. Tabor — any time of year, but especially in summer. I’ve never been but the Capricorn and fry bread are calling my name. 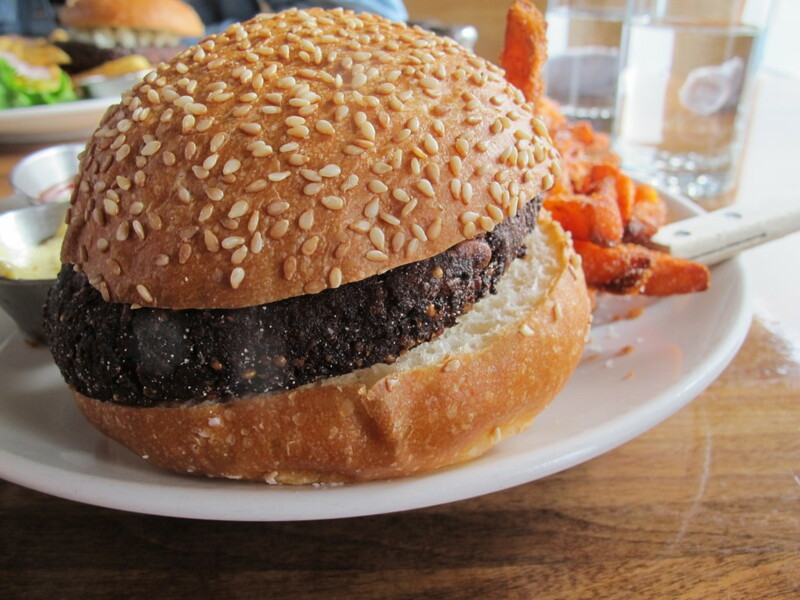 F likes the Veggie Burger at Deschutes, I like the version at Portland Penny Diner tho we also hear good things about the one at Veritable Quandry, have you had those? Ohh haven’t been yet, but sounds worth it. Time to book a babysitter!!! Looking forward to reading about your veggie burger findings! Luckily, it’s pretty kid-friendly during the day, too, if you happen to have one with you. No kids’ menu, but they have high chairs and brought my toddler a covered cup with a straw. Ooh, finally, a review of a restaurant I’ve actually been to! 😉 I went to this place for happy hour once and got a delicious chicken liver mousse pate – it was not long after I started eating meat again and was so excited to see nutrient-dense organ meats on a restaurant menu! I loved the decor at this place, too! Me too. It’s very cozy without being dim or cave-like. We used to live over there and still have never been. I have heard about the fry bread! We used to live withing walking distance. All those missed fry bread opportunities. I’d almost say they’d go well together, but that sounds like a lot of carbs at once. Cheese plate to the rescue! That looks like the best garden burger. And I’ve witnessed quite a few that were less than stellar. Sadly, the less-than-stellar are quite common. Tell me Kelley, why is the observatory named that? Is there an academic vibe? You know, I’ve never actually been there after dark, but I think they have lights that resemble starst. During the day, there’s a lot of light due to the high ceilings and tall windows. It’s also on Mt. Tabor, where I suppose there’s a lot of stargazing going on. You had me at crispy sweet potato fries! I’ll have to check this place out! I have to report that I dipped the end of my veggie burger in ketchup, and then dipped that in the tiny crumbs of sweet potato fries. Not my proudest moment, but maybe my best bite of the meal. I’ve heard SUCH good things about this place, but still have yet to visit. This post has me drooling!! Let me know what you think if you go!